Deltona: John C. Masiarczyk Sr.
Our goal in engaging our local leadership is to bring unity and focus to our counties to make the transition to 100% renewable energy. By getting as many mayors as possible to sign in our counties, we can build the transition as a team. There are almost 600,000 people in Volusia and Flagler counties, nearly one-third over the age of 60. Many jobs here offer low wages. By bringing the Ready for 100 campaign to our area, we can address the issues of high electric costs relative to income, poor energy efficiency in homes and businesses and social inequity. This program can help all communities by generating local jobs, creating new businesses, and supporting the transition to energy efficient homes. In addition, instead of relying on dirty coal and gas power plants, we can bring our electric grid to the local level with clean power. We thank our dedicated volunteers, who have been vital to our success, and also the National and Florida Ready for 100 teams for their support and guidance. Support your local Ready for 100 team - they are making a difference! 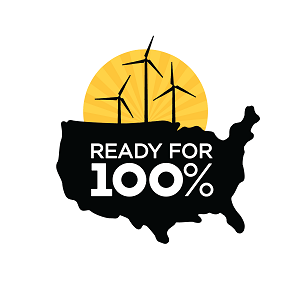 Sierra Club’s Ready for 100 Campaign is urging mayors and cities across the country to commit to a goal of 100 percent clean and renewable energy. In Florida, 28 mayors have signed on to the Mayors for 100 Percent campaign and three cities – St. Petersburg, Orlando and Sarasota – have passed resolutions with target dates to move forward with renewable energy. 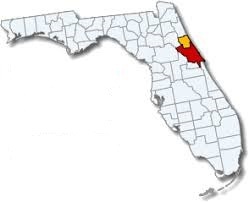 FRACKING – Support a state ban of hydraulic fracking, acid fracturing, and acid matrix stimulation for natural gas and oil in Florida. • Fracking and disposal of fracking fluids pose unacceptable risks to our water supply and deplete the water resource. • Toxic chemicals used in fracking are associated with serious health threats including cancer, cardiotoxicity, neurotoxicity, liver and kidney toxicity, and reproductive and developmental toxicity (EPA Final Assessment 2016). ENVIRONMENTAL FUNDING – Fund both land acquisition and environmental infrastructure needs. All Amendment 1/Land Acquisition Trust Funds generated by Document Stamp Taxes must be used exclusively to acquire, improve, restore, and manage conservation and recreation lands. Fully fund Florida Forever! Provide adequate additional funding from other sources for environmentally beneficial projects such as septic tank upgrades, sewer conversion, wastewater treatment plant upgrades, and for water supply improvements and agency expenses. • Over 1,000 people a day are moving to Florida. If we fail to protect our open and natural land from development quality of life will decline, clean air and water will disappear, and Florida’s people and economy will suffer. • Florida has made some poor choices with respect to regulating pollution, and with a population of more than 20 million, those choices are having a significant impact on the quality of life and economy of the State. Septic tanks, outmoded wastewater and stormwater treatment systems, and poor agricultural practices are damaging the very water we drink and that supports most of our economy. WATER SUPPLY FOR NATURAL SYSTEMS – Require Minimum Flows and Minimum Levels (MFMLs) to be genuinely protective of water bodies instead of massaging them to allow unsustainable withdrawals for development or agriculture. Monitor how much water is withdrawn under Consumptive Use Permits, so realistic water budgets can be developed for regions of the state. Incentivize, and where necessary mandate, better water conservation. • Water Management Districts are responsible for setting MFMLs that are designed to prevent significant harm to the water resource or ecology of the area, yet their computer models result in MFMLs that are far below historical flows and levels. REGULATION – Protect private property and natural resources from unsustainable degradation caused by pollution. Oppose state preemption of local rules and ordinances more restrictive than state provisions, such as in local control of fertilizer management or plastic bag/single-use containers ban/restrictions. • Local governments are accountable under the Clean Water Act for polluted waters in their jurisdictions; preempting their ability to address these issues puts them and their citizens in an untenable situation. • Water pollution issues must be addressed on a watershed-by-watershed basis, not one-size-fits-all. • If local governments overreach in regulation, residents and businesses either will elect new officials or vote with their feet. Trust the marketplace. TRANSITION TO RENEWABLE ENERGY – Florida’s concentration of coastal development makes it particularly susceptible to sea level rise; CO2 and other greenhouse gas emissions must be reduced to address this threat to our communities. • Invest in money-saving energy efficiency and renewable energy systems for state and other public facilities. • Reverse fossil fuel industry and allied investor-owned utility “capture” of the Florida Public Service Commission. • Include infrastructure for electric vehicles in Florida’s long-term transportation planning and budgeting. To read the full Sierra Club 2017-18 Legislative Platform, click here. Sierra Club Florida commemorated the 150th anniversary of John Muir's historic Thousand Mile Walk to the Gulf on Cedar Key last month. 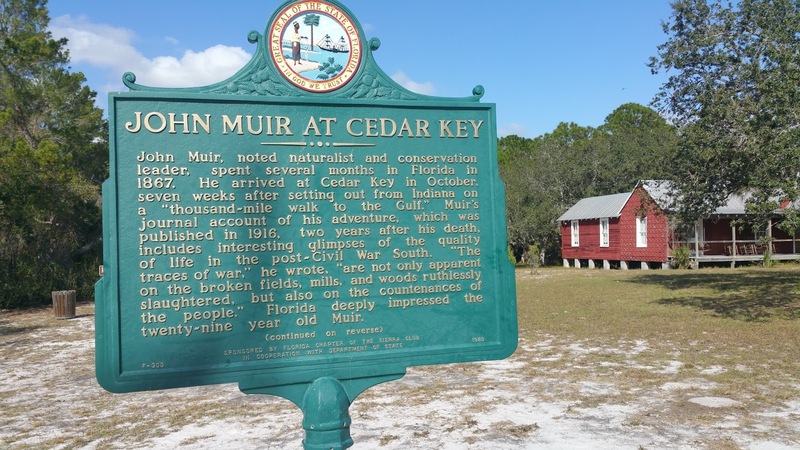 The two-day conference focused on the Sierra Club founder's travels in Florida, his illness and months-long recovery on Cedar Key. It also delved into the present and future of the at-risk Gulf island in the age of climate change and sea level rise. 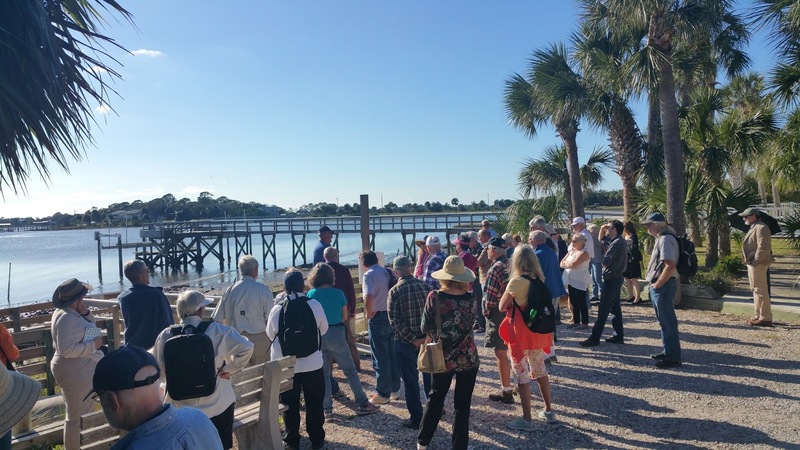 On the first day, University of Florida scientists and architects based on Cedar Key presented the most recent effects of sea level rise and projections to a standing room only audience of 75 people. Cedar Key Mayor Heath Davis and Councilwoman Sue Colson discussed plans for the island and how it is prioritizing its spending to manage the effects in this working oyster and clam harvesting community. The most revealing presentation was by Marty Hylton of University of Florida's Historic Preservation program of a 3D flood simulation of Cedar Key. John McPherson of the Cedar Key Water and Sewer District gave an unfiltered discussion of climate change impacts on water supply, sewage and drainage. Later, UF professors led a tour of G Street, a low-lying street experiencing flooding and erosion and an example of a living shoreline. The day concluded with a presentation by Sierra Club staffer Jon Ullman of the most recent Al Gore Climate Change slide show. Guests were treated to a Clam Bake and entertainment by local singer/songwriter Anna White Hodges. Day two focused on the Florida portion of John Muir's walk to the Gulf that originated in Indiana. 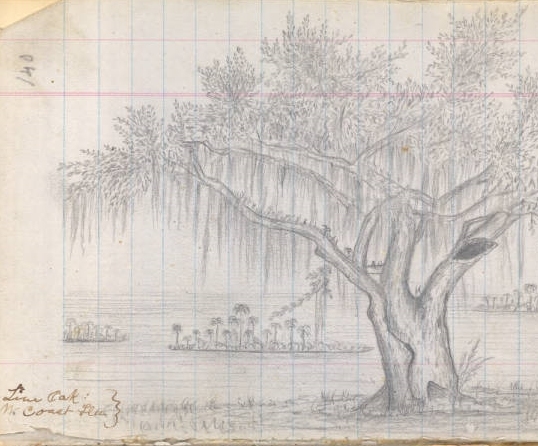 After taking a ferry from Savannah to Fernandina Beach, Muir walked along rail road tracks through Gainesville and on to Cedar Key, where he had planned to board a ship to the Amazon. However, a malaria-carrying mosquito that bit him while sleeping in the Savannah Cemetery had incubated causing him to collapse. 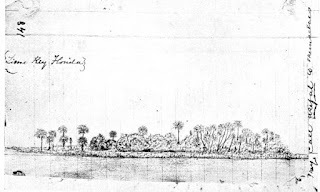 He was nursed to health by the wife of a sawmill owner for several months, spending much of his time under a giant oak tree observing the neighboring islands. A model of downtown Cedar Key before filled with water. about the sanctity of all living beings formed and, when he was well enough, he boarded a ship to Cuba before embarking on a boat from New York City to San Francisco and heading to his beloved Yosemite in the Sierra Nevadas. The audience of 100 was treated to a series of experts including Merald Clark, a Gainesville authority on John Muir's Florida travels, Amy Gernhardt, the executive director of the Cedar Key Historical Society, and Andrea Dennison, who recounted her own detective story tracking and identifying the giant oak where John Muir's health was restored by Sarah Hodgson. Later, Paul Thibault presented an expert's synopsis of the malaria that almost killed Muir and the controversial toxic treatment that also nearly took his life. Later the Sierra Club rededicated the John Muir Historical Marker, heard from experts at the local historical museum and visited the famous John Muir oak tree. 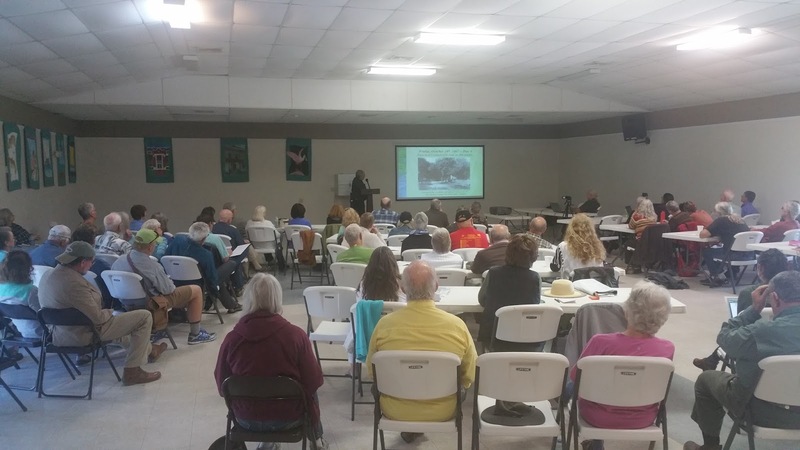 The talk was organized by Paul Thibault, on behalf of Sierra Club Florida, with the support of the Suwannee-St. Johns group of the Sierra Club and the program was moderated by Sierra Club Florida Director Frank Jackalone. - Oct. 18 Arrives in Gainesville. - Oct. 23 Arrives in Cedar Key. 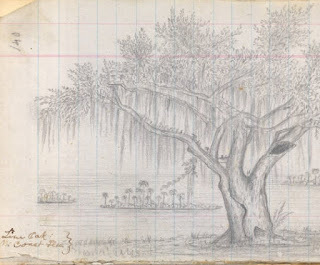 - Jan. 10, Muir leaves on boat for Cuba, then, via New York City, he boards a ship to San Francisco and journeys to the Sierra Nevadas. In November, clean water activists, including Sierra Club members, won a long hard fought battle to protect a county with more than 1,000 lakes. The Lake County Commission voted 3-2 to ban the use of lawn fertilizer during summer months when rains produce algae blooms in nearby lakes, rivers and streams. The winning vote was cast by Commission Chair Tim Sullivan who had voted against an earlier ordnance and switched his vote. "Lake County is unique," he said, so he would "err on the side of caution." Although a Model Urban Fertilizer Ordinance had already been passed last spring, county staff and advocates, including Keep Lakes Beautiful, Lake County Water Authority, Lake Soil and Water Conservation District and Lake County Planning and Zoning, worked to strengthen it. They met with other county staff and reviewed other county ordinances that had put in place more protective ordinances that ban summer fertilizer applications entirely. The committee recommended a 15-foot zone between fertilizer and any water body and a 50 percent slow-release nitrogen fertilizer during non-summer months. Lake County now joins other 11 counties and 82 cities with strong ordinances. Said Ron Hart, Director for the Lake County Water Authority, "After all, we are Lake County, not Lawn County. " 17 speakers supported the ordinance. Representatives of Scotts Miracle-Gro and True Green who were present opposed the ordinance. The ban will begin in one year and will include an education campaign. It will not apply to flowering plants or vegetable gardens. St. Pete Solar Tour Shines Light on Sun-Powered Living: Learn How To Host a Tour In Your Area! Nearly 50 participants got an inside look at how local homeowners and businesses are using solar energy and energy efficiency to save money and help tackle climate change during the November 11 2nd Annual 100% St. Pete Solar Tour. Co-hosted by Suncoast Sierra Club, St. Pete EcoVillage and the League of Women Voters of St. Petersburg, the event featured a wide variety of Florida-style sustainable living and working with five homes and two commercial applications. Planet Fitness fitness center with solar panels on canopy shading its entrance. for sustainability to a two-story, 1,800-square-foot house nearly a century old. The commercial examples included the 20,000-square-foot Planet Fitness renovated strip center building and a solar-covered carport on the campus of the University of South Florida St. Petersburg. At each location, tour participants got to hear from the homeowners and businesspeople firsthand and ask questions about costs, return-on-investment (ROI), energy savings and challenges. Paul Ertel lives a clean energy life, free of coal, natural gas, and oil. In 2016 Ertel added a Chevy Volt plug-in hybrid electric vehicle (EV) to the mix, plus six solar panels to roof of his garage. Even with charging his EV for six months, he still got a $40 credit for the year from Duke Energy. A commercial pilot, he also thrives on the research and technology involved in energy. “It was like a project to see if I could do it,” he said, adding that buyers need to do their own research before purchasing solar. When former St. Petersburg City Councilman Karl Nurse and his wife bought their 1926 home in Old Southeast St. Petersburg 25 years ago they “started at the beginning” by adding attic insulation. Since then they’ve added Low-E film to their 25 windows, a natural gas tankless water heater, more energy efficient lightbulbs and a programmable smart thermostat. The thermostat, which enables him to save about 15% on power, “has a pretty tremendous payback,” said Nurse, who now serves on Suncoast Sierra’s executive committee (ExCom). About five years ago, Nurse installed solar panels on the back portion of his roof, preserving the aesthetics of the home’s distinct Florida Craftsman style on the front. Combined with their energy-saving measures, the solar reduces his family’s electricity bill by about 70%, he said. Karl Nurse shows how to bring clean energy to an old house. Based on the positive experience at home, Nurse recently installed solar panels on the roof of a new 3,000-square-foot building for his growing manufacturing business, Bay Tech Label, also based in St. Petersburg. He said he saved about 30 percent on the solar installation costs by designing the building and roof for solar from the beginning. He estimates the solar will have a six-year payback in energy cost savings. Architect Tim Rhode is transforming a small corner of St. Petersburg into a self-sustaining family compound shared by he and his wife, two daughters and their children. The oasis within the city includes three homes, a workshop, small organic farm and many energy- and water-saving features. His goal is to ultimately generate enough power, water and food to sustain the 11 people living there. One of his biggest energy-saving moves was to downsize from a 3,600-square-foot home in old Northeast to the 750-square-foot house he built behind his daughter’s home. “To convince my wife we could live in such a small space, I went through and labeled the spaces in our old home that we actually used. Then I showed her how we could provide for all those activities in this design,” said Rhode. He designed the home for passive cooling and heating so it uses no additional heat or air conditioning. The solar panels on the roof generate enough electricity for the home – with some to spare and send over to his daughter’s home. The home also includes a 12,000-gallon cistern that collects rainwater for use in the farm. No maintenance required: Homeowners reported that their solar installations continued functioning without problems or any special maintenance. At most, they said they rinsed off the panels about once a year. Zero damage from hurricanes: Despite some high winds brought by Hurricane Irma, hosts said their panels sustained no damage. They explained that in Florida, solar panels are required to stand up to hurricane-force winds. Simple energy efficiency measures deliver high return: Besides solar, each home and business owner stressed that basic energy-saving steps played a major role in their strategies to cut electricity consumption and costs. Don’t underestimate the value of switching to LED lightbulbs, using Low-E windows or film and other actions. Do your research and ask for help: Like any home or business improvement, owners need to double-check the claims made by solar companies. Many Florida cities now have solar co-ops set up by Solar United Neighbors of Florida, an initiative led by the League of Women Voters. The co-ops offer both education and savings for homeowners interested in going solar. A solar tour can be a great way for local Sierra groups to promote renewable energy and energy efficiency and increase awareness in your area. This can be an especially effective tactic for promoting your group’s Ready for 100 campaign. · Recruit coalition partners to help organize the event and attract participation. For example, the Suncoast Sierra Club, partnered with St. Pete EcoVillage and the League of Women Voters of St. Petersburg to plan and stage their 2016 and 2017 solar tours. · Identify tour sites. Brainstorm ideas with your partners about potential sites, preferably representing a selection residential, business and school/government/nonprofit installations that would make compelling examples of solar and energy efficiency at work. Aim for a variety, from small to large and different situations, with interesting stories to tell. · Plan logistics. The locations need to be within a small enough geographic area to keep the tour within 3 hours. For example, the St. Pete tour featured 7 sites and ran like clockwork, running from about 9 am to Noon on a Saturday. Plan to use a bus with capacity for about 50 participants and map the stops to make an efficient route. Allow at least 15 minutes at each stop. Over-flow participants can use their own vehicle, but only if the bus is full, to minimize emissions. · Base the budget to break even. This shouldn’t be a fundraiser. 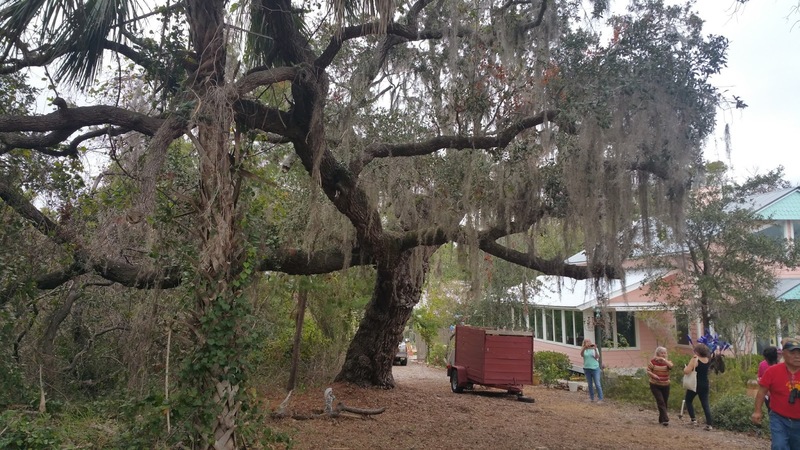 For example, the St. Pete tour cost $10, with an option to pay $5 more to enjoy a lovely organic garden lunch after the tour at the St. Pete EcoVillage. With 50 participants, the event netted $100 after expenses, according to EcoVillage Co-Director Chris Kenrick, which included a rented school after expenses bus and driver. · Promote the event widely. Engage media to list the tour in their event directories. Line up newspaper, blogosphere and broadcast reporters in advance to attend and cover the tour – emphasize the event’s great visuals and opportunities to interview home and business owners. Promote the event via email, website and social media for each coalition partner. These are just the basics for your group’s leaders to consider. If you want to move forward, reach out to your local Ready for 100 team. There’s probably a team already active in your area. 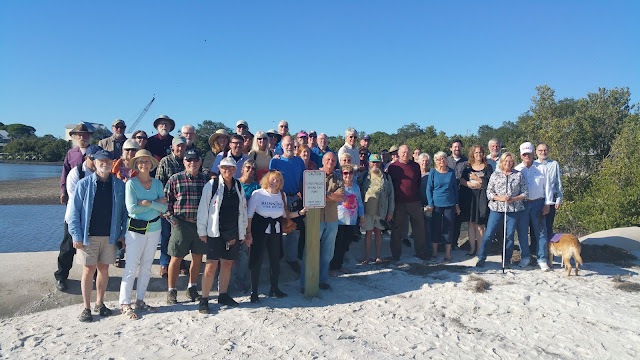 For more info on how to organize a solar tour in 2018, and how to connect with your local Ready for 100 campaign, contact Sierra Club FL Ready for 100 Senior Organizing Representative Phil Compton at 727-824-8813, ext. 303 / phil.compton@sierraclub.org. If you’re in South Florida, contact Ready for 100 Organizing Representative Emily Gorman at our Miami office, 305-567-0022 / emily.gorman@sierraclub.org. Last month, Sierra Club Suncoast Group members stood in support of St. Petersburg Mayor Rick Kriseman and Green Housing provider Bright Community Trust’s efforts to make affordable housing truly affordable and sustainable. Partners came together at one of the new solar-paneled homes to showcase this new concept of combining affordable housing with solar technology. During the event, key members of the community spoke to the need for more affordable housing as well as green solutions to help frontline communities deal with the effects of income inequality. While most efforts only consider the affordability of buying the home, Bright Community Trust takes into account other crippling expenses, such as utilities. Standing in front of one their newly finished units in Downtown St Petersburg, Bright Community Trust spoke extensively about their intention to create more options for people looking for cost-effective solutions. Mayor Rick Kriseman spoke about the need for the city to invest in projects like this, projects looking to alleviate the burden of poverty while also contributing towards making our environment healthier.The showcased house, the first of many of this type, is an affordable housing unit fitted with solar panels. It is to be sold to someone making 80% or less of the area median income (approx. $33,500/yr).The property is located on a community land trust, which helps ensure that the subsequent buyer also meets the criteria of being at or below 80% of the area’s median income. The Sierra Club applauded the Bright Community Trust for being forward thinking and said it was extremely excited to see collaboration and support from local officials like Mayor Kriseman. An inspiring coalition of community groups, corporate partners, and elected officials are collaborating on clean energy and community wealth building projects. The forward-thinking solutions emerging from this work give us all immense hope for a brighter future for the Sunshine State. 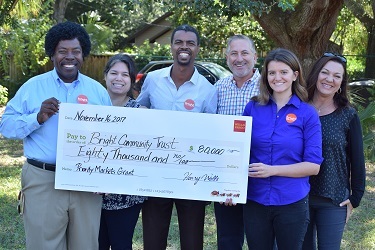 Wells Fargo has committed $80,000 to assist Bright Community Trust in acquiring solar panels to be installed on affordable housing units in the coming year. NOTE: While the Sierra Club appreciates the contribution of Wells Fargo to making this solar project a reality, it still has serious concerns with Wells Fargo’s involvement in dirty fuels globally. Between 2014 and 2016, Wells Fargo invested at least $5 billion into the coal, oil, and gas industries that are driving the climate crisis. Wells Fargo has been a major financier of the Dakota Access pipeline, as well as TransCanada, the Canadian oil company behind Keystone XL.